The art installation ?Critical Mass? reflects the combined vision of local artists Miya Hannan and Jenny Yoshida Park, who collaborated on the design of this installation for TEDxSanDiego. Seen together, the figures in ?Critical Mass? become a miniature audience. 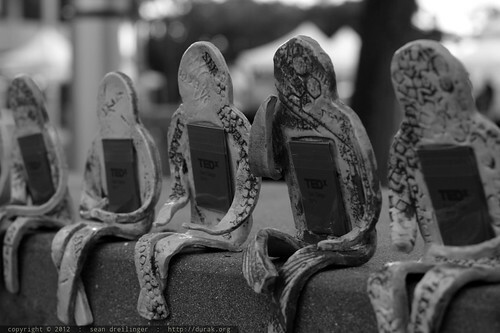 When taken individually, the figures represent each person?s role as an agent of change. Each figure holds a small book with questions for the attendees to go out into the world and ask themselves and others in order to begin to create change in the world, both small and large. The installation of the figures is incomplete until each attendee of TEDxSanDiego brings a figure home with them at the end of the day, and uses it as a starting point to share the day?s messages with their community.